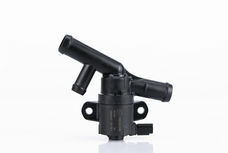 Following the successful launch on the American and Japanese markets, Rheinmetall Automotive has now been awarded its first orders from Chinese customers for the current generation of coolant valves. Two Chinese auto manufacturers have recently placed orders worth a total €25 million with Pierburg GmbH, a member of the Rheinmetall Group. With startup of production scheduled for 2019 and 2020, the coolant valves will be installed in various models of the auto brands including SUVs, which are of growing popularity in China. The orders are for 2-way coolant valves each with two switching states for interior heaters in cars powered by 1.0- and 1.5-l turbocharged engines as well as 3-way valves for temperature control of the battery in electric vehicles. The valves will be manufactured in Pierburg's Chinese plant in Kunshan for shipment to the OEMs' production plants in China and the USA. The cutting edge of Pierburg coolant vales is their vast variability. Despite their compact design, they feature pressure compensation for high flow rates coupled with low pressure losses. These modules can even be used in the main cooling circuits of autos. The three-way version, which activates two coolant circuits, can be used both as a mixed and a splitter valve, thus allowing hybrid vehicles, for example, to switch between the electric heating system circuit and engine waste-heat utilization.